There are still a lot of romantic fairy tales about how the Tarot as we know it came into existance, and most of them are just that: fairy tales. There have been no secret esoteric doctrines mediated through mysterious imagery, they were no Hermes, Thoth or other deities involved, no Gipsies delivered any long forgotten wisdoms and surreptitious tombs beneath ancient pyramids certainly never existed in order to store a gallery of Tarot cards for future magi wannabes. In a way, though, it is true that the Tarot came from Egypt (well, the Middle East) - albeit not in form of a sacred and occult wisdom, not as a relict of Egyptian priests but rather as a game of Arab warriors. It were the Mamluks who brought the cards along in the fourteenth century - those legendary Islamic armies in the service of the Ayyoubides or the Caliphat, warriors and cavalry soldiers whose whole life centered around their warcraft. For their entertainment they engaged in archery and combat games, in polo and more laid back pastimes like backgammon, chess and card games. These playing cards of the Mamluks were called 'Na'ib' and usually contained 52 cards in four suits: swords, cups, coins and polo sticks. Each suit had 10 number cards and three 'Na'ib' cards resembling our court cards known as Malik, Na'ib Malik, and Thani Na'ib (King, Viceroy, Deputy or Second Viceroy). It is fairly certain that the cards had once reached the Middle East from China where playing cards came into existance along with the wider use of paper. While we do know that the old Chinese also had different suits in a card deck the four suits brought to Europe by the Mamluks very much corresponded to the Mamluk life: they lived for the sword, ate and drank from cups, were happy to have some coins to spend and enjoyed to get some fun and achieve some honor in the prestigous polo game. All four suit signs also happened to be heraldic signs in the Arab world, probably dating back even earlier to the Persian version of virtues. The Europeans adopted the game which is revealed by the Spanish word 'naipes' and the early Italian 'naibi' for playing cards (In 1376 a new card game called 'naibbi' was forbidden in Florence - as we know with little lasting effect). They also adopted the Arab suits when especially swords, cups and coins were familiar items, only the polo sticks did not make much sense to them. 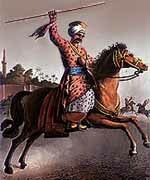 Polo was a game played in Persia as early as the 6th century BC and had been very popular in the Islamic world ever since but it was practically unknown in Europe (the English first discovered it somewhen in the 19th century in India). Thus the polo sticks were renamed in batons or wands when this came closest to what Europeans could see in them. A sure sign for the Arab heritage are the curved swords that were uncommon in European weaponry that time but their original form survived even in late Marseilles decks - most likely to better differentiate them from the straight batons (former polo sticks). Malik, Na'ib Malik, and Thani Na'ib became king, knight and page, and one of the first things the Europeans added to the court cards was at least one female, most important of course a queen. Some early decks had as many as six court cards when there was a female counter part to every one of the originals: the queen to the king, a dame to the knight and a maid to the page. And, of course, they provided the court cards with human imagery were the Arab cards - true to Islamic custom - were composed from calligraphy and ornaments. When the trumps were added to the game still remains largely in the dark. Since Na'ib and its European offsprings were trick games they most likely have been literally trump cards - 'trionfi' in Italian - that could win over the lesser valued suit cards. The trumps themselfes had different values so that a higher trump would beat a lesser one. Quite naturally these trumps were given a more salient design to adequately express the importance of the card. In the mid 15th century the production of playing cards had become a thriving business for miniature painters, engravers and wood cutters alike, so much that in 1441 the card makers of Venice even asked the city to ban or at least regulate foreign imports of cards that threatened their trade. Tarot - or rather Trionfo as it was called in those days - was but one of the popular card games that were played all around. Its special attraction stemmed from the trumps which allowed much more artistic freedom for the producing artists than the fixed suits. Especially prosperous people enjoyed ordering Trionfo decks to show them off or to just own them - we must not forget that in those times imagery, pictures and graphics were no cheap mass productions like today. When someone could present a beautiful crafted pack of cards, probably even a hand painted one, it was truly something special. When we look at the Trumps of the Sola Busca deck from ca. 1490 we can get an idea what the trumps also stood for - they told a story, perhaps taught a moral, paraded values, virtues and standards that most people were familiar with. The Sola Busca trumps do not make much sense to us nowadays (and most likely would have caused serious headaches to the likes of Gebelin or Levi) but in their time they told a story and maybe a lesson. We identify a Mato (Fool) and a row of prominent Romans from the late Republic era along with two legendary Babylonian kings. While we might be hard pressed to scrape together our history knowledge these have been most telling and most likely entertaining images for educated people of the late 15th century. The trumps as we know them today are a pure brainchild of the Renaissance, a picture book of 15th century's Italy, its values, fashions and mindset. In order to grasp their character we have to take a little look into those truly remarkable days.